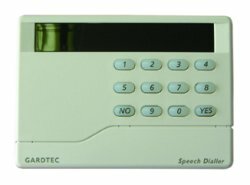 Speech dialler with 3 relay inputs, can store 5 telephone numbers and store 1 long message and 3 short message. The EL019 autodialler is ideal if your site is not occupied , it can make phone calls to deliver a recorded voice message. It can be programmed with a list of up to 5 telephone numbers. The autodialler when triggered will call each of the telephone numbers in turn until someone answers, it then plays a recorded message. The dialler acts in the same way as any telpehone extension cable and does not affect any other telephones plugged into the same line. The EL019 autodialler can be programmed with a list of emergency telephone numbers. When there is a problem, the dialer calls each of the telephone numbers in turn until someone answers, then it gives a message saying that there is a problem. The dialer behaves in the same way as any normal extension and does not affect the operation of other telephones connected to the same line. The EL-019 is only suitable for use with UK phone systems. Reading out of range or sensor fail.